Call 201-656-8500 or email now for a free case evaluation. Get the Legal Guidance You Need to Take Back Your Life Today! Don't worry, talking to us is easy. When you call with a legal problem, you won’t be charged for our time … we won’t confuse you with fast-talking legal jargon … and you won’t feel pressure to make an appointment. You can also send us an e-mail, or we’ll even come to you for a free and no risk consultation. You also get a proven track record and an unmatched commitment to clients that begins with your FREE no-obligation case evaluation to assess your situation. You’ll receive an easy-to-understand explanation of your legal options and a commitment to aggressive representation. The 2016 Justice Served Awards honor each of these nominees for their commitment to a safer, more just America. Tell us which story moves you the most (see our nominating criteria below), and we’ll enter you into a drawing for a free subscription to Consumer Reports. Dr. Mona Hanna-Attisha continues to lead the fight for kids suffering from lead poisoning in Flint, Mich.
Today we all know that the ill-fated decision to switch the water supply in Flint, Mich., from Lake Huron to the Flint River to save a few bucks in the state budget caused dangerously high levels of lead in local drinking water. But if not for Dr. Mona Hanna-Attisha, a passionate young pediatrician at Hurley Medical Center, the threat of lead poisoning – especially to the children of Flint – might never have been uncovered. 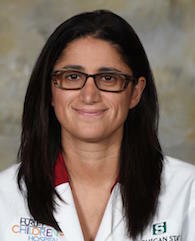 Dr. Hanna-Attisha, or Dr. Mona as she is affectionately known in Flint, knew something was wrong when she started seeing a marked increase in rashes and hair loss in her little patients. She and her team analyzed hundreds of hospital records and found that the toddlers of Flint were suffering from extremely high lead levels in their blood. Knowing that it was her moral and ethical duty to share her research with the public as soon as possible, Dr. Mona held a press conference. But instead of taking action, state and local officials spent a week denouncing her findings and attacking her character before finally admitting she was right. Two weeks later, Flint’s water supply was switched back to Lake Huron, and an entire nation soon learned about this scandal. Senator Al Franken is leading legislative efforts to ban mandatory arbitration. 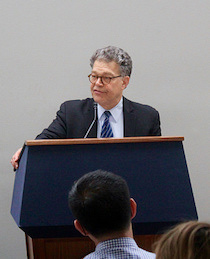 Senator Al Franken (Minn.) has spent years trying to protect Americans from “forced arbitration” clauses, which he calls “an attack on the constitutional rights of all U.S. citizens.” These legal loopholes are increasingly found in consumer and employment contracts, mandating that disputes must be settled by binding arbitration rather than in court. Because these arbitrations are closed to the public and the arbitrators are often handpicked by the company, consumers and employees almost always lose and have no right of appeal. These clauses increasingly prohibit class action lawsuits as well, eliminating another powerful tool used by consumers to hold corporations accountable. Dan Carder and his small band of researchers brought Volkswagen to its knees. Dan Carder, director of the West Virginia University Center for Alternative Fuels Engines and Emissions, knows his field of study isn’t very exciting. His research team is often overlooked and underfunded. But when the Center was commissioned to test emissions from diesel cars, the results upended Volkswagen and eventually put Carder on Time magazine’s list of the 100 most influential people in the world. It all started in 2012 when the Center received a $50,000 grant from the International Council on Clean Transportation for an on-road test of diesel emissions standards. Volkswagen boldly claimed its diesel cars were both environmentally friendly and fuel efficient, but test after test showed that the numbers didn’t match up. In fact, Volkswagen diesels were emitting up to 35 times the safe amount of nitrous oxide gases. Eventually the company fessed up that more than 11 million vehicles were equipped with software designed to cheat on emissions tests. Since then, Volkswagen has recalled 700,000 vehicles in the United States alone and must spend more than $15 billion in settlement claims to buy back or repair the affected vehicles. Tina Meier with pictures of her daughter Megan. Life was looking up for Megan Meier after years spent struggling with depression and attention deficit disorder. She had just started eighth grade at a new school, had joined the volleyball team and would have her braces off soon. She also began chatting online with a boy named Josh Evans, who wanted to be her friend. Weeks later he turned on her and soon hundreds of cruel messages about Megan were posted on a bulletin.. Josh’s last message said that everyone hated Megan and that the world would be better off without her. That night Megan committed suicide. Six weeks after Megan died, her mother Tina learned that Josh never existed. His account was set up by a neighbor on their block and her daughter, a former friend of Megan’s. Tina Meier created the Megan Meier Foundation to fight for her daughter’s legacy. The Foundation’s mission is to “Promote awareness, education, and positive change in response to issues surrounding bullying, cyberbullying and suicide.” Today Tina travels around the country, speaking to students, educators, administrators, parents, counselors, law enforcement officers and other professionals about the dangers of cyberbullying. Tina hopes that she can empower young people to celebrate individuality and accept others in order to make a kinder and safer world.